Ralston Crawford was an important American artist who created images of the American industrial landscape. Working in a Precisionist style, his imagery is characterized by flat, geometric planes illuminated by shafts of light and shadow. Although not as well known as his Precisionist contemporaries Charles Sheeler and Charles Demuth, Crawford worked in a variety of media painting, photography, lithography, drawing, and film. Ralston Crawford (Canadian/American, 1906-1978) is recognized for his Precisionist style paintings. Throughout his career, industrial subjects and urban life dominated his abstract compositions of simple, flat areas of color. Younger than his Precisionist contemporaries, Charles Sheeler and Charles Demuth, Crawford was inspired by their paintings in the Barnes Foundation, which he encountered while studying in Philadelphia between 1927 and 1930. He would develop his style over the next several decades. Although recognized as a painter, Crawford was also a printmaker and photographer. These mediums offered an immediacy in the creative process that enabled a fresh response to the world he observed. 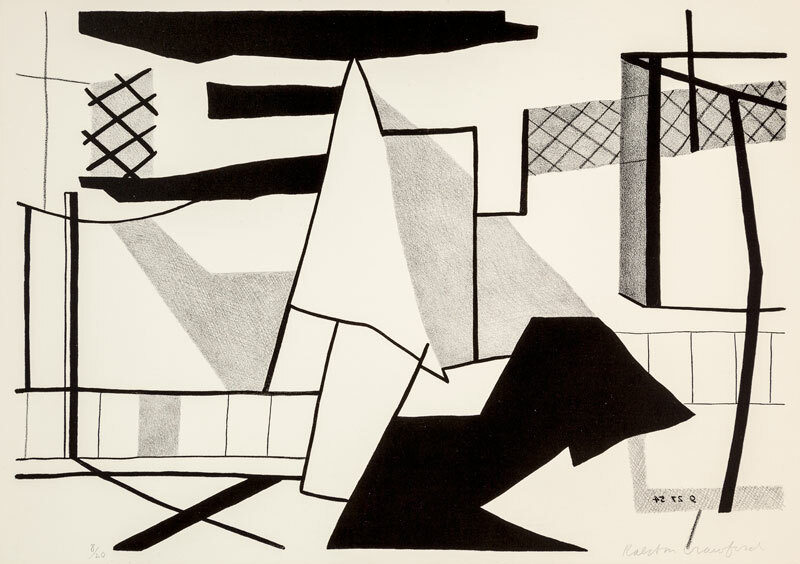 In 2008, the University of Wyoming Art Museum acquired five lithographs and ten photographs by Crawford. Forming the basis for Ralston Crawford: Lithographs and Photographs, the exhibition is enhanced by additional works on loan from the artist's son, Neelon Crawford. Collectively, the exhibition reveals Crawford's skill and artistic eye for rendering subjects in a language of planes, lines, and shapes. The underlying emphasis on structure in his work indicates his deeply intellectual, almost analytical approach, coupled with personal reaction and experience. The subjects and style of his lithographs and photographs reflect these two approaches. Whether working in photography or lithography, Crawford's images focus on a particular scene or a specific location. The lithographs in the UW Art Museum collection were created during a pivotal period in Crawford's artistic career between 1951 and 1959 in Paris. It was while he was living there with his wife and two sons that he worked in lithography. He found Paris to be an inspiring city, and he especially enjoyed Parisian lithography techniques that were experimental in approach and process. The city encouraged a degree of collaboration between artist and printer that Crawford felt could not be found elsewhere. Although working in a new medium, it is these works that exemplify his Precisionist style.